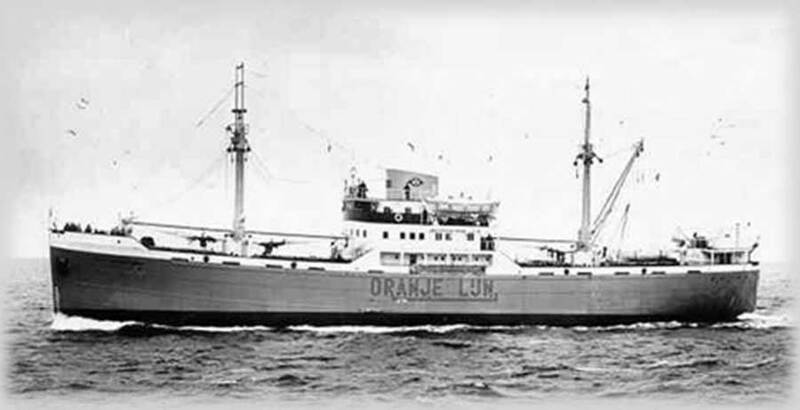 Built and launched in 1948 as a proud product of the Norwegian shipbuilding industry, the Prins Willem V made a voyage to the Great Lakes to serve as an oil screw, hauling commodities like gas and oil, leather, engines, and appliances. Initially her keel was laid in 1939 but her building was delayed by WWII and the fact that the Nazis sunk her in Rotterdam Harbor to prevent allied forces from penetrating the area. Her imposing size of 258 feet in length, beam of 42 feet and a weight of 1567 gross tons made her a solid workhorse on the lakes for nearly 6 years. Sadly, she met her fate in 1954 when she departed Milwaukee with a mixed cargo during a storm with high winds and heavy seas. The Prins Willem succumbed to the depths after the crew was able to abandon her. She came to rest on the clay bottom in 70 feet of water. Today, she rests on her side intact with her cargo still in her holds. She has some hatches open and large tanks used in the multiple salvage efforts still rest alongside her. The Prins Willem V is a great wreck for divers of all levels to explore and enjoy some bottom time on. We visit the Prins Willem V from Milwaukee on the Alma.